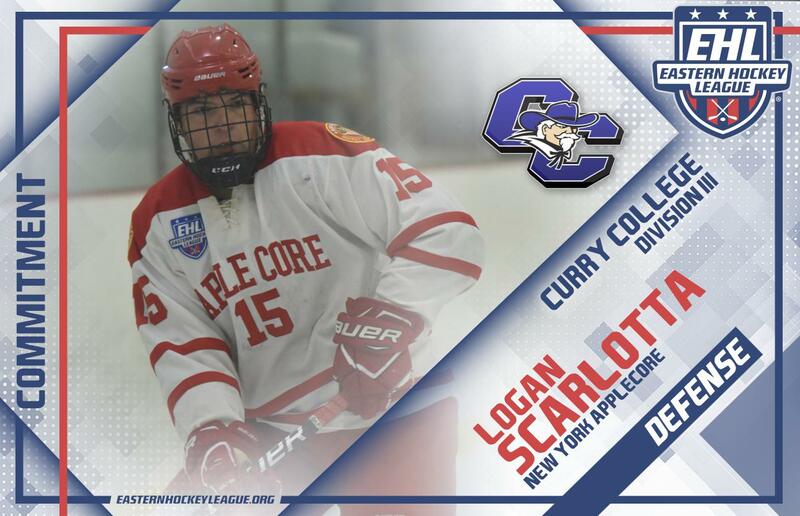 BREWSTER, NY -- Logan Scarlotta, a defenseman for the New York Applecore, has committed to Curry College for the fall of 2019. The '99 native of Saratoga, NY is in his second season with the Applecore, and to date, he's tallied 35 points in 87 career games in the Eastern Hockey League (EHL). With still a month remaining in the regular season, Scarlotta's 19 points so far this year has already surpassed the 16 total he notched during the 2017-18 season. With Scarlotta's commitment, the EHL has now sent at least one player per season to Curry. In total, the talented defenseman is the 11th player in league history to make this decision. When Scarlotta arrives on campus, he'll be joined by Alex Ochterbeck and Nick Magill-Diaz. The pair of former Philadelphia Little Flyers are each enjoying their freshman campaign with the Colonels. With this weight now off of his shoulders, Scarlotta can turn his full focus towards the upcoming EHL Playoffs. If the postseason started today, the Applecore would be the #6 seed in the Mid-Atlantic Conference, which would earn them a rematch with last year's Second Round opponent, the Philadelphia Revolution. Learn more about the New York Applecore on the team's official website, and check out the full 2018-19 NCAA commitment list.